The Daily Prompt: What do you do to keep an edge? My suggestion for parents? 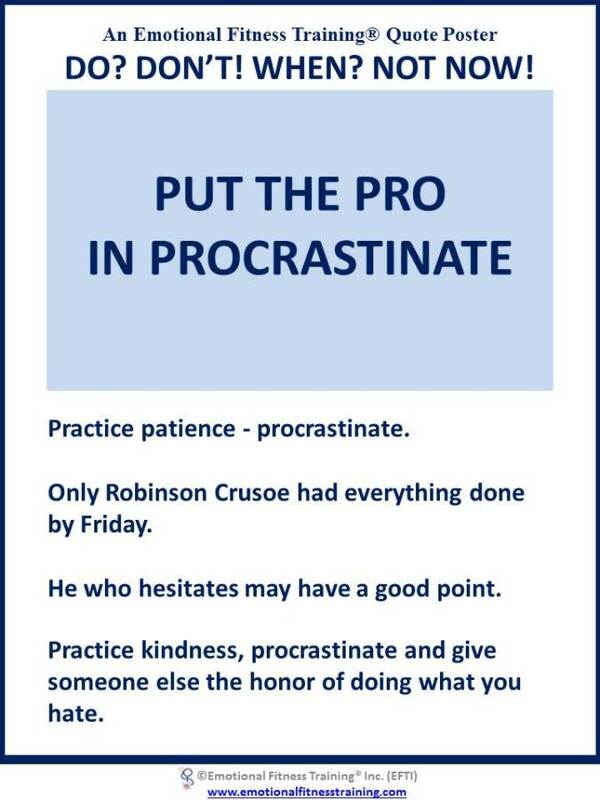 Become a Professional Procrastinator. What is worth doing gets done. Maybe later than sooner, but it gets done. Maybe not by you, but it gets done. Maybe not as you would have done it; maybe better. Maybe never, then it didn’t need doing. Do not procrastinate when it comes to staying strong. Go here to practice one of my Twelve Easy Emotional Fitness Exercises. Once learned these are as easy as breathing. The most important one is Practicing Kindness and for parents that starts with being kind to you. Remember to share and care. I am grateful for all you do to keep me strong. This entry was posted in Self Care and tagged challenging children, Emotional fitness, Emotional Fitness Training, Humor, inspiration, Katherine Gordy Levine, parenting, parenting tips, postaday, procrastination, The Daily Post, The Daily Prompt. Bookmark the permalink.